Which Riu Cancun Resort is Your Best Pick for Cancun All Inclusive Resorts? We've evaluated the Riu Cancun Hotels based on thousands of Cancun travel reviews to help you decide which Cancun all inclusive resorts are the best fit for you! There are three Riu Cancun Hotels - Riu Palace Las Americas, Riu Cancun, and Riu Caribe . 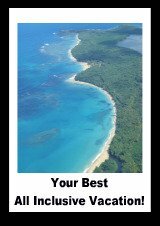 We've summarized each all inclusive Cancun Mexico destination below – what it offers, what recent guests liked or disliked, and who should consider vacationing there to help you choose your best all inclusive vacation packages. All three Riu Cancun Hotels share the same general area in the Cancun Hotel Zone and guests at one resort also have access to the facilities of the other two. Each Cancun all inclusive resort has it's own atmosphere and specialties. The Riu Palace Las Americas hotel is the most luxurious – and the most expensive – of the Riu resorts in Cancun. It is a 4 star, moderately priced ($$$) resort in the Cancun Hotel strip close to clubs and shopping. The Riu Palace Cancun consists of 372 suites, ranging from the basic junior suite to the hot-tub suite, which boasts a living room, dressing room, and a balcony with a hot-tub. Meals and beverages at 6 restaurants (including steak, seafood, fusion, Mexican, and Japanese) and 5 bars (including 1 poolside and 1 swim-up bar). Kid's club, pool, and playground. Sports and activities including live entertainment, gym, tennis, ping-pong, and water sports. Use of the facilities at the Hotel Riu (transportation not included). 88% of reviewers recommended Riu Palace Las Americas for your all inclusive holidays. It comes in at number 6 on our Top 10 Cancun Hotels listing. The majority of reviewers were couples (87% recommend the Riu Palace Cancun), followed by families (80% recommend the Cancun Riu Palace). Travelers loved the resort facilities, the friendly staff, the food, the pools, the wait service at the pool, and the great location close to clubs and shopping. Reviewers commented that the rooms were clean but rather small, and several reviewers noted a pervasive moldy smell throughout the property (fairly common in tropical destinations). Reservations for the restaurants require at least two-days notice. Of the three Riu Cancun all inclusive resorts reviewed, the Riu Palace had the quietest atmosphere. 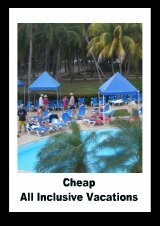 Couples gave the highest reviews of this hotel although many families also loved their time at the Riu Palace. 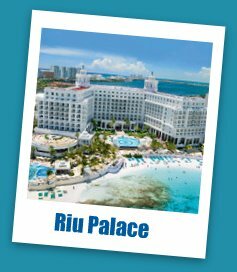 The Riu Palace is recommended as a couples getaway or for families who don't require a ton of kid centered activities (very young children or teenagers). If you love Cancun but find the Riu Cancun Hotels aren't for you, please check out our Cancun All Inclusive Resorts page for more Cancun all inclusive vacation options. Riu Cancun is Riu’s mid-priced ($$), 4 star Cancun all inclusive resort. The Riu Cancun Hotel has 596 rooms to choose from, and guests have the option between a double room or a junior suite. Both come with ocean view and balcony or terrace. The standard in-room amenities (satellite TV, AC, etc.) are included. Meals and beverages at 3 restaurants plus one poolside restaurant and 5 bars. Kids club, pool, and playground. Sports and activities including entertainment, gym, sauna, nightclub, tennis, ping-pong, and water sports. Hotel Riu Cancun is recommended by 83% of reviewers and it ranks 13th of all the Cancun all inclusive resorts. The majority of guests were couples, followed by families and groups of friends. Travelers thought the buffet was good, the restaurants varied in quality, and the staff were friendly and helpful. While the rooms were clean, there was a delay in maintenance of public areas, particularly the beach. Public areas can be quite crowded. Hotel Riu was described by reviewers as a solid three-star resort that was pleasant for people of all ages. Guests looking for absolute luxury or solitude should check out other Cancun all inclusive resorts. Hotel Riu Caribe is a 3 1/2 star value edition ($$) of the Riu Cancun resorts. It has 506 rooms with the same features as those listed for Riu Cancun. The Riu Caribe is slightly outside the main hotel zone. Meals and beverages at 4 restaurants plus one poolside restaurant and 4 bars. 2 pools including one with a swim-up bar. Scuba diving in the pool. Sports and activities including entertainment, gym, sauna, hot-tub, tennis, ping-pong, and water sports. Hotel Riu Caribe is recommended by 85% of Cancun hotel reviews (a slightly better recommendation rate than the Riu Cancun), and it ranks 12th in our list of top Cancun all inclusive resorts. The most numerous reviewers were couples, followed by families. The high points were the cleanliness of the rooms and the (mostly) positive comments about the food. The staff as a whole was friendly and helpful, but more than one guest was put off by the rudeness of the receptionists. Air conditioning was limited to the rooms. The rooms were somewhat dated, and the overall vibe was basic accommodation but at the right price. This resort can be rowdy and noisy (as with many cheaper Cancun hotels). The Riu Caribe is recommended for couples and groups looking for a cheap all inclusive Cancun vacation who like a bit of activity. Those looking for a soothing, peaceful, and relaxing experience, luxury accomodation, or couples looking for a romantic getaway may do better with the Riu Palace. Riu Palace Las Americas would be a good choice for families and those looking for a quieter, slightly plusher vacation. Hotel Riu Cancun would make a good choice for those looking for three-star comfort. Hotel Riu Caribe, the least expensive option, would probably be a better fit for budget-conscious couples and groups who aren’t looking for private, romantic all inclusive vacation packages in Cancun. Top 10 Cancun Resorts listing. Cancun travelers love the great weather, close proximaty to shopping and clubs and the Mexican culture ... not sure a Cancun vacation is the best Caribbean holiday for you? 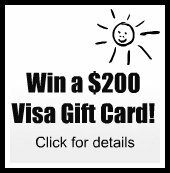 Check out luxurious Jamaica vacation packages; the tropical beaches of Punta Cana resorts; relaxing Cuba vacations; and action packed Bahamas all inclusives.